SMS Limit Unlock Note:"SMS Limit Unlock" software is free but use it on your own risk because we are not the vendor of this software. Question: How does "SMSGadget Bulk SMS Sender For Android" work? How do I connect my Android phone to the computer? How can I remove the AD text "Sent by SMSGadget" that is appended to all outgoing SMS? 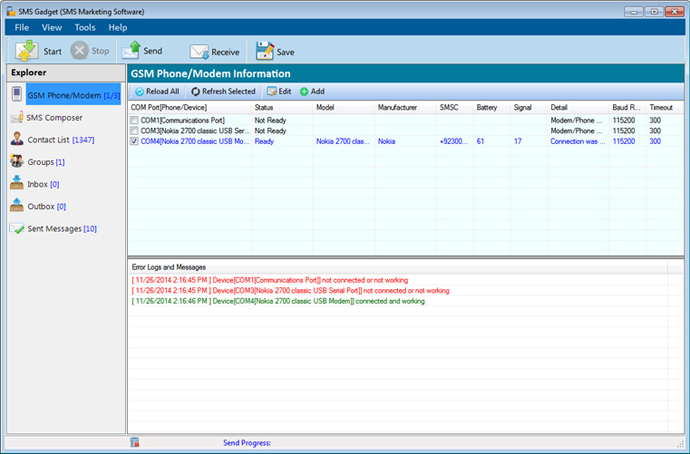 Answer: SMSGadget connects to the Android phone (connected on your local network) via "SMS Modem App" running your phone and sends SMS message to "SMS Modem" App and App is responsible to send the message. Similarly to read/delete SMS from Android phone SMSGadget connects to "SMS Modem" App. Answer: Our software supports Android Phone. Question: How do I connect my phone to the network? Question: Where can I find the "SMS Modem" App for my Android phone? Question: Which brand of Android phones does SMSGadget Bulk SMS Sender support? Our software supports most of the Android phones. Question: How can I remove the AD text "Sent by SMSGadget" that is appended to all outgoing SMS?